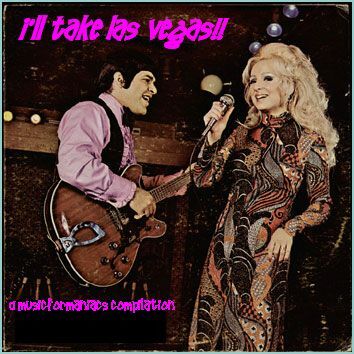 As I wrote last year, "Here's a repost of a lounge singer's original ode to Vegas (Mike Hudson - "I'll Take Las Vegas") and a slew of brilliant and/or hilarious lounge versions of rock hits performed by totally unknown (well, except for Louis Prima, of course) performers' private press releases that were probably only available at their shows (often autographed), which I have lovingly ripped from vinyl. I've been collecting these for years, searching used record store bargain bins, garage sales, and thrift shops." These are tunes that I've posted here over the years, and since they got knocked off-line, I've thrown 'em into a zip folder, along with stuff like Paul Anka's version of Nirvana's "Smells Like Teen Spirit," though it is most certainly not a lounge record in the strictest sense - it was released on a proper label, not a private press, and Anka is, of course, a main-room headliner, not an obscure lounge cat playing 3 shows a night, six nights a week. New! Some very brief TV production tunes by Moog-master Mort Garson, a swingin' instrumental cover of the Kinks' "All Day & All The Night," finger-snappin' singers doing CCR's "Proud Mary" and The Who's "I Can See For Miles," a non-surf version of "Miserlou," and another jaw-droppingly hideous medley from Art Casara (by request! ), a guy I first featured on the 365 Days Project. It's always special when a lounge album features, amongst the predictable standards, original compositions, and we have a few here: the title track, and songs about tennis, and Los Angeles. Let's be honest: there's often a reason why these cats never made it out of the lounge to the big time. These albums can be a bit bland sometimes, but they're worth picking up for those occasional amazing, transcendental tracks (as featured here) that reward the patient crate-digger, and because these albums have no collector's value and can be had for next to nuthin'. Labels: covers, Lounge, Outsider, Space Age/Moog/Theremin etc. This is awful (except "Medley No.1", which is terrible) ...I love it! Who's that swingin' couple on the cover? They are Kathy & Tony Rich, perhaps in the midst of Miserlou-ing. I must have more music by The Note-Ables! I am truly dying. This is the best stuff I have heard in years. Jon W.
Alas, I don't actually have the Note-Ables album, I got it off the now-defunct Bellybongo website. Anyone got it? taku: it's back! New link. These really tickle my funny bone, which makes up for the ear pain. Lol. Thanks much! Hey DJ Useo! You are very welcome. Hopefully a tickled funny bone supresses the gag reflex. Downloading and steeling myself for this gem(s). A fantastic mix! Thanks! I liked the Candi track but the mindblower here is the Miserlou, I reckon. "WHEN MARIMBA RHYTHMS START TO PLAY..."
WOLF VS. WHALE! SPOCK VS. THE SUNDANCE KID!